We are very trusted Parking block manufacturers, this is one of Unimat Traffic best seller product is our 6’ Parking Blocks, we are the best nation Parking block suppliers, this product is satisfaction guarantee, the 6’ parking block is a top of the line traffic products, great to be placed in any parking areas, such as: schools, public, parking lots, public parks, private companies, mall parking building, even in private condos and residential areas. 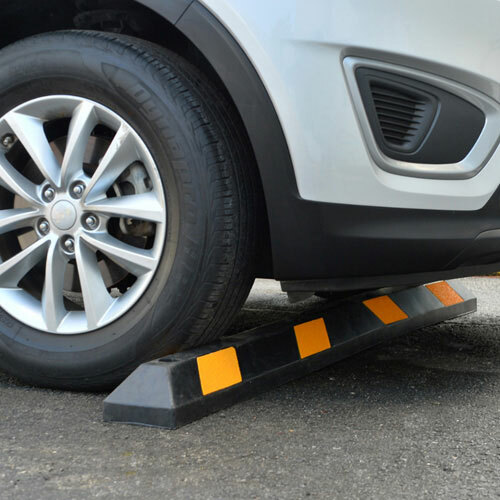 Unimat 6’ parking blocks are sturdy and durable and easily to be carried and installed by one person, since they are light weighed just 34 lbs., also this product is very cost effective, it has an excellent durability at a very low cost. We have the best quality and lowest prices Parking block for sale. Call us today and ask for our Recycled rubber Parking Block so you can have give also a more professional and safe look to nay parking area, they feature molded reflective tape for high visibility and safety. Commercial ‘Parking blocks are made with high standards and we at Unimat Traffic offers the best prices on the market, we have all of our products in stock and they are ready to be shipped right away, please give us a call and one of our sales representative will be more than happy to assist you!